Busy puppies means happy puppies and less getting into trouble! It’s so important to stimulate their little minds and nothing is more motivating than treats. 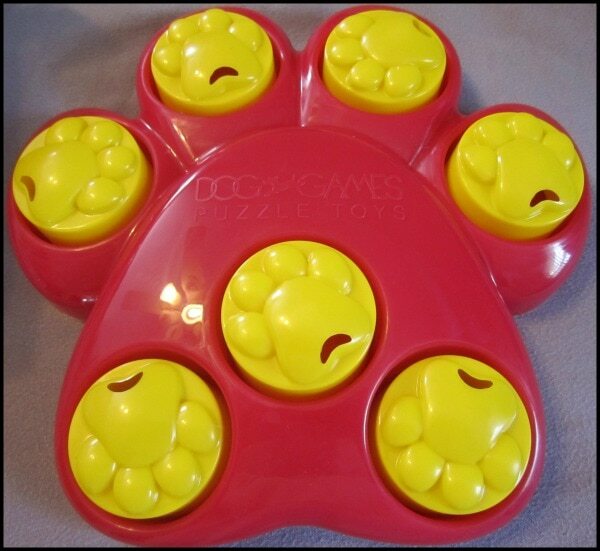 With a Dog Puzzle you can keep them entertained and challenged for a long time. Product received for review. The Grump is now a little over 5 months old. He is the most food-motivated animal that I have ever met! We jokingly call him a “Roomba” because he just walks around slurping things off the floor. (Actually, it’s quite horrifying, too.) Needless to say that this Dog Puzzle is ideal for him. The concept of the Dog Puzzle is simple. It’s kind of like a hide & seek game for pets. Just hide a treat in one or more of the chambers and watch your pet try to figure it out. This provides necessary mental stimulation and prevents boredom in your pet. It’s like a fun doggy treasure hunt! The first use was a little rough. As you will see in the video, The Grump had a hard time figuring out how to get his treats. His little brain was definitely working! You can see that at one point he gets the top off, but then Hilo snatches the treat. Whoops. I think he was a little confused, but he eventually got the hang of it! I recommend trying this if you have a food obsessed pet. You can see in the video that Hilo loses interest quickly. Unless the treat is obviously there, he’s not really into putting in the work to get it. Grump is determined, but needed assistance the first couple times. You don’t want them to think the puzzle is a chew toy, so you have to guide them along. Overall it’s a really cool way to keep your pet busy, entertained, and stimulated! 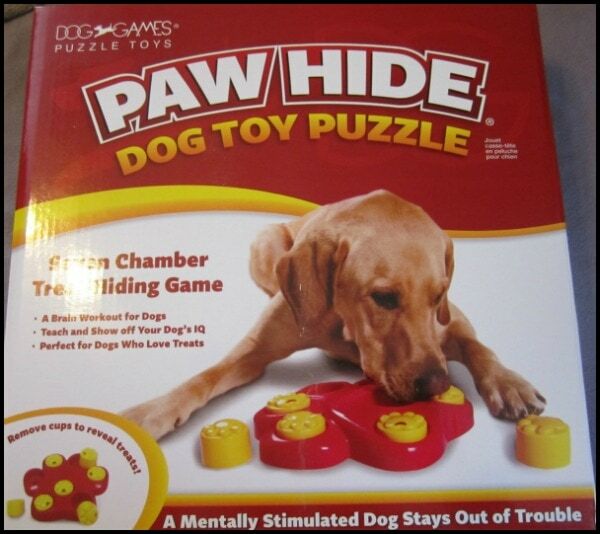 Dog Puzzles can be purchased on the Paw Posse website for $23.95. I really like the Auto Zip Line for dogs! LOL at the Water Shoes For Dogs. My dog would not wear them. I like the Dog First Aid Kit, I never knew they has these. I really could use the Thunder Jacket for one of my dogs. My Chi/Terrier mix is terrified of loud noises. Lisa, Jodi, and Gloria – thanks for the positive comments. Good luck in the giveaway! I love that they carry Kong brand toys. They are the only toys my dog can’t destroy in a matter of minutes. I’m sure my dogs would love the agility tunnels! I was surprised to see water shoes for dogs! I love the Collapisble Tub for big dogs. Automatic Dog Feeder With Timer.. I think it would be handy! I think our pups would love the Dog Agility Tunnels! There wasn’t a place to put my youtube user name…it’s “euphmansgurl” 🙂 Thank you! My dog, Artie would love the Dog Agility Tunnels. He loves to go to the park and follow the kids thru the tunnels. They sell another treat game called the Interactive Tornado Game that would be neat to get my dog, too. She is quite the little “tornado” herself. LOL! I like the dog crate fleece beds. I know my baby loves my fleece blankets. I like the rain coat. I would love to watch my dog play with this lol! I like their Kurgo Wander Bed. I love the large dog collars and large dog leashes. Something made specifically for my large dogs and to keep them safe. Thank you. My dog Jack is a Frisbee Fanatic! Seriously…he lives for it…even sleeps with his favorite frisbee! Paw Posse has a disc called The Best Dog Frisbee that I’d LOVE to give to Jack! It floats, too, so we could play in the water with it! I love the fact that you offer items specially made for large dogs to keep them safe and make their lives easier. Thank you. I like the Interactive Tornado Game. I think my 11 month old would like this when we are gone. I like the Thundershirt, I’ve been wanting to try one for a while now because my dog is really afraid of thunderstorms, which are frequent in Florida (we moved here last year from Illinois) and fireworks, and we also live near a police shooting range. Sigh… I hate to medicate him, even if it’s all natural herbal supplements, and think this sounds like a great idea, if it works! I could use the Thunder Jacket for one of my dogs. It would really help keep her calm on the 4th of July when fireworks are going off everywhere. love their agility tunnels for dogs! I love the open tunnel! Exactly this. I want a toy so badly for my 5 dogs. This would keep them entertained SO well.. especially my 2 youngest. Just not something I could afford at the moment.. but I know they get so bored! I like the Thunder jacket wish it came in Red or Black! I like the Dog Agility Tunnels! I’d love to get the dog agility tunnel for my mom’s goldendoodle. she’s great at them! The Thunder shirt. I’ve seen it on TV and was surprised it is also on this website. The thunder jacket! Our Cooper is super freaked out by loud noises and I someday want to get one of those to see if it helps him. I like the Kurgo Wander Bed. Thanks! I would love to have a Thunder Jacket for my little dog. He is terrified of storms. watershoes for dogs..!! that would be great at the beach! I like the cooling bed! I also like the The Thunder Jacket For Dogs by Thundershirt. The agility tunnel is something my dog could use. I like the water shoes. I like the Thunder Jacket for dogs. my dogs would LOVE the super squeaky dog toy!!! Our Schnauzer puppy would love the boy pup a puzzle! The Thunder Jacket! My dog NEEDS one…. the dog with shoes ! cute! the auto zip line looks like a lifesaver! Would love one of those! The Airline Approved Dog Crate looks very nice!